PHOENIX, AZ — Maricopa County officials have confirmed that they have been subpoenaed and will testify before a federal grand jury next week in regards to an Arizona sheriff. Maricopa County Manager David Smith and Deputy County Manager Sandi Wilson have met with a federal prosecutor and are ready to testify on Wednesday. Wilson further clarified that the trial is indeed related to the current investigation of Sheriff Joseph M. Arpaio. Both Smith and Wilson are among the many who have had conflicts with Sheriff Arpaio since he was elected to office in 1993. The inquiry into Arpaio was originally in regards to charges that the sheriff has continually violated civil-rights laws and is guilty of using racial profiling, but now the the investigation has expanded to include accusations that Arpaio has abused his power as sheriff by settling political scores against rivals and those with whom he has clashed over the years. Sheriff Arpaio has been criticized for many years regarding his methods and treatment of prisoners. He is passionately outspoken about immigration and is known for his controversial comments and love of the spotlight. I first started paying attention to Sheriff Joe in 1996 when Scott Norberg had been murdered in his jail. Norberg had been high on meth at the time of his arrest, and Joe’s deputies placed him in a restraining chair that has shackles for his legs and arms, after they beat him and used a stun gun on him repeatedly. The multiple stuns from stun guns had subdued the man, but for some reason the deputies didn’t care for his attitude, so they dragged him to the chair and Norberg started wrestling once seeing the contraption. They strapped him in, and this is in front of cameras, and then Norberg was yelling, so two of the 14 deputies wrapped towels around his neck and mouth from behind and Norberg continued to struggle because he couldn’t breathe. The deputies killed him by strangulation, proven by an autopsy, and for some reason Sheriff Joe kept the man’s mandible in his office. The Norberg family filed a wrongful death suit against Sheriff Joe and his deputies. Something to remember, is that Scott Norberg had yet to be charged with a crime or stand before a judge. He was in holding. Now, the good citizens of Maricopa County praised Joe and his deputies because the man was a violent, schizophrenic drug user and he deserved to die. Scott Norberg’s family painted a different picture of their husband/father/son, and the man did struggle with drug use, but he wasn’t known for violent tendencies. So, when the investigation for wrongful death came around and the Norberg family’s lawyer requested the mandible for evidence, suddenly Sheriff Joe couldn’t find it! Sheriff Joe “lost” crucial evidence for trial. The Sheriff and the county settled before the case went to court and the Norberg family collected 8.25 million dollars in a wrongful death settlement. Since Mr. Norberg’s death, the restraining chairs have been banned in Maricopa County jails. I’ve never forgotten this case or Scott Norberg’s name and have followed Sheriff Joe since. I’m trying to remember the case of the European (was he Dutch?) and his experience their. Apparently BBC got wind of it and Sheriff Joe raised a ruckus about them ‘Eurotrash’ or something. I have no recollection of that, and I follow Sheriff Joe’s dealings and wheelings closely, but it wouldn’t surprise me if I missed a story. I remember parts of this story but I didn’t know some of those details!!! 1996?!? Isn’t there another one about a councilman and getting beaten and thrown in jail for not have his papers correct? Or am i mixing up many stories. One could sit all day and read the articles in the New Times and EVT. This “man” doesn’t belong in jail. He needs “extraordinary rendition” and tortured for about 10 years. When the crucial piece of evidence was missing, was when action should have been taken to investigate Sheriff Joe. Actually, Sheriff Joe had no business having a piece of evidence in his office. There’s another story about Joe’s deputies that I’ll never forget, regarding the murder by his deputies of a 17 or 19 year old kid that’d been speeding. He wasn’t involved in a police chase, but pulled over when he saw the flashing lights. The kid was unarmed and when he got out of the car, he didn’t drop to the ground fast enough, so they killed him. That family collected millions for wrongful death, too. Update -- Federal witnesses called before the grand jury still fear Sheriff Joe and the MCSO. j’avaz, If this wasn’t so serious it would be a story in The Onion or a nightly soap. They may have to move to A.J., j’avaz! Maybe they could move into the sphere. The New Times article hints that the grand jury has been in session on this for a while. Further justification for Goddard? Probably, and it is a smart political move by Goddard, and yes, I’m voting for him, but he still should have stepped in a long time ago. Sheriff Joe’s been out of control for far too long. And did you see this dreadful response to the article? > IF YOU CROSS THE AFGHAN BORDER ILLEGALLY, YOU GET SHOT. > IF YOU CROSS THE SAUDI ARABIAN BORDER ILLEGALLY YOU WILL BE JAILED. > AND YOUR FATE WILL BE SEALED. > POLITICAL PRISON TO ROT. I don’t even know where to begin with that, but do find it mighty ironic that they would defend a Sheriff that resembles the “law” enforcement in some of those countries. The case before the Federal Grand Jury is not about racial profiling or Sheriff Joe’s questionable illegal immigrant sweeps, but is about his abuse of power and that’s blurring his supporters’ vision. Sheriff Joe and his sidekick, the county AG Andy Thomas continuously abuse their power and that’s the issue. Phoenix Mayor Phil Gordon has a clerk who happens to be an American of Mexican descent. His clerk was out with a group of people in the desert and they were all out riding ATVs. Sheriff Joe’s deputies just happened to see all the dust so they went to investigate and it was Gordon’s clerk that was asked to show her papers proving she was legal. There are actually ordinances about dust in some areas, so the deputies warned all the others, and Gordon’s clerk was the only person given a ticket. Gordon was outraged and publicly criticized Arpaio, and within days, the sheriffs deputies showed up at the Phoenix Mayor’s office and confiscated all the computers and other documents without a warrant and using some flimsy excuse of wrongdoing by the mayor. 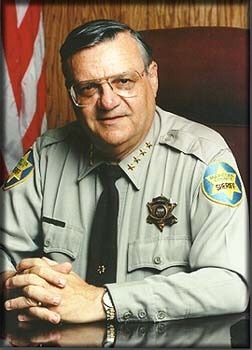 Once again Gordon was outraged and criticized Sheriff Joe, and the sheriff did try filing, very publicly, a motion for opening a criminal investigation into Gordon for something, and then the charges were quietly dropped and the computers and papers returned. By then, the damage to Gordon’s reputation had taken a hit, but Gordon has remained strong in this and he might be one of the people called before the Grand Jury. That’s just one very minor incident regarding Joe and his retaliatory practices against his critics. But Arizona is a redneck racist state and Sheriff Joe remains quite popular. Like all redneck racists, they refuse to acknowledge that their leaders are breaking the laws. j’avaz, this guy is really kinda frightening. He seems almost unstoppable. I hope someone is able to get him under control (preferably under lock and key) in the near future. Oh, I could tell you stories about his jails and tent city. The people of Maricopa County ignore the multi-millions of dollars that the county pays out for wrongful death suits for their loved ones that were jailed under Sheriff Joe. What does it say about every single wrongful death suit that is filed is plea-dealed out with the families collecting millions of dollars in settlements, instead of the Sheriff contesting the suits and taking them to trial. Sheriff Joe, for some reason, never lets a case go to trial for wrongful death, and it leads me to conclude that he doesn’t want the truth known about the abuse in his jails. The articles provided on this thread from the New Times regarding Sheriff Joe are vast and go back for years. Heck, Joe even had the reporters of the New Times arrested in the middle of the night a few years back! That’s documented in the New Times, too. Have to admit I had heard of him even a couple of years ago. But I had no idea how--actually--demonic this guy really was/is. He apparently fears no one! I’m gonna run out to 4 p.m. church for a bit (maybe say a prayer that this guy has the brakes applied to him), and will be back (I hope) latah! That one and others was carried in the Tucson Weekly. Go and be pious, k’es and sin no more! Quick howdy to you, b’ito! Hope you’re well. Back later! Good report j’avaz and like you say this is just one of many stories! J’avaz, Wonder if this is why Goddard didn’t go after “Sheriff Joe”—the Feds were after him! That saves his reputation in AZ for his run for Guv, and “Joe” still gets charged. Goddard ends up with clean hands. I’ve thought about that, too, and maybe that’s his reasoning. I’m hoping that someone finally reigns in Joe and Candy Thomas. javaz -- we have family and friends there. This is downright scary! You be safe, too! Thanks for the updates. I particularly liked the article featuring Linda Ronstandt and her reasons for joining the protest January 16th in Phoenix.